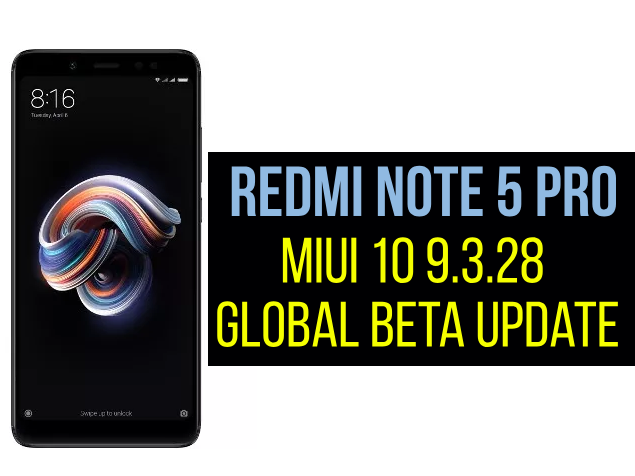 Redmi Note 5 Pro got its first MIUI 10 9.3.25 Global Beta ROM update from Android Pie last week. Another update has now begun to roll out for users of Redmi Note 5 Pro. For Redmi Note 5 Pro users, Xiaomi has published links to update the latest version of MIUI 10 9.3.28 Global Beta ROM. This new update largely brings fixes related to the lock screen, password and PINs, battery indicator in the shade of notification, and also brings along the security patch for March Android. Xiaomi published on its forums links to the Android Pie-based MIUI 10 9.3.28 Global Beta ROM update for Redmi Note5 Pro Rs. 10,999 users. Using the Recovery ROM method and the Fastboot ROM method, Redmi Note 5 Pro users can update when running on the beta version. You will need to flash your phone in both cases, and a step-by-step guide has been detailed for both methods. Backup your smartphone as data is wiped out by the manual flashing process. The change log for the Android Pie-based MIUI 10 9.3.28 Global Beta ROM consists of the March Android security patch and a whole set of fixes and improvements. The update fixes errors that occur when passwords and PINs are entered, a virus scanning issue that started after users tapped the results of a completed scan, a status bar issue that did not allow the battery indicator to disappear when the notification shade was opened on the lock screen. Other improvements include adding passwords while applying transparent wallpapers and fixing issues with displaying Lock screen notifications. The MIUI 10 9.3.25 Global Beta update in closed beta also brought the system-wide dark mode feature, which wasn't brought to the open beta. The Redmi Note 5 Pro received a price reduction in India in January. The variant of 4 GB RAM received a price reduction of Rs. 1,000 while the variant of 6 GB RAM received a price reduction of Rs. 2,000. The Redmi Note 5 Pro 4 GB RAM variant is priced at Rs. 12,999 after the price cut, while Rs. 13,999 offers its 6 GB RAM model. The Redmi Note 5 Pro is available through all retail channels, including Amazon.in, Flipkart, Mi.com and off-line stores.